Did you know that of those who make New Year’s resolutions, only 8 percent achieve their goals? That leaves 92% who fail. I knew the success rate was low, but that’s truly stunning. Considering this harsh reality, why do people even bother with resolutions anymore? Making crazy, rigid and unattainable goals at the start of a new year are simply unreasonable and unrealistic so it is no wonder people fail with that approach. Success is found when you can consistently make small adjustments, minor tweaks so that you continue to figure out how you can feel your best. I have never been a goal person, but I do love to challenge myself to find a recipe that is free of grains, gluten, sugar and dairy but still so absolutely fabulous, you just want to shout from the highest mountain and tell everyone. The test was two different Paleo brownie recipes. We celebrated New Year’s Eve with test batch #1 courtesy of Cook Eat Paleo food blog. Though it was good, it was a bit more cakey than I like, but eat them we did. Readers should note that these brownies were left at room temperature for two days (covered with foil) and they did not dry out or change in texture. This recipe calls for almond butter, eggs, ghee, cocoa and honey. Test batch #2 was different in that the recipe doubled the almond butter to one cup, the same amount of eggs, did not call for butter of any kind, used less cocoa, half of a cup of coconut milk as a liquid and a sprinkling of chocolate chips for more melted chocolate goodness and sweetness. Both recipes were made using the food processor and within just a few minutes and a few pulses, a rich and dark chocolate batter came to life. Our winner is the second batch which turned out more fudgy than cake-like. I also like the addition of chocolate chips and coconut milk swapped out for the half a cup of ghee. While everyone else is suffering, starving and just saying “no, thank you” to anything decadent in January, go ahead and make these brownies. And then celebrate that it’s only January, knowing you can repeat this experience over and over again through the entire year. Guilt free. If you fall for a chocolatey-fudgy brownie, this is the one for you. The bonus is that it is gluten and grain-free and sugar-free. 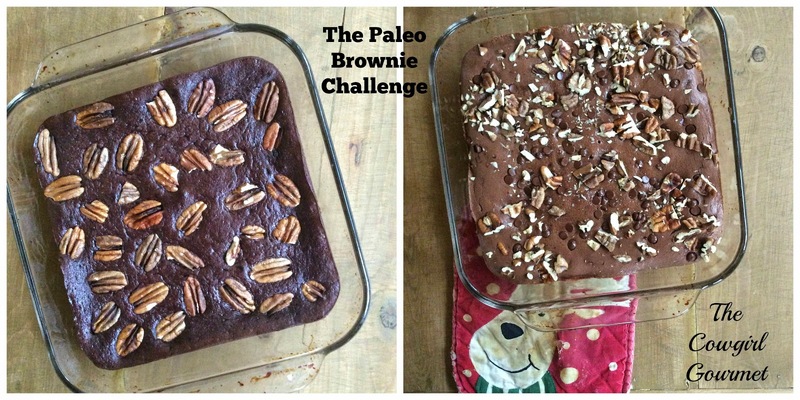 Definitely one of the best paleo brownies we have ever had. Preheat oven to 350 degrees. Grease an 8x8 pan with coconut oil and set aside. Add the almond butter, milk and eggs to a food processor and pulse until it comes together. Then add cocoa, salt, vanilla and sugar and continue to pulse until the batter is chocolately and gorgeous. Pour the batter into the prepared pan, sprinkle the chocolate chips and chopped nuts and bake for approximately 22 minutes. Remove from the oven and allow to cool thoroughly. Cut into 9-12 squares and serve.